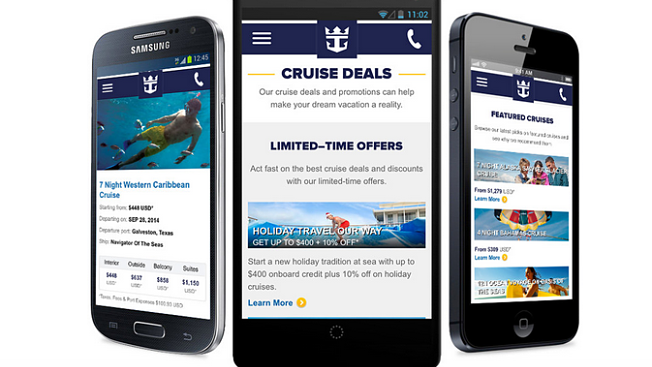 Can Mobile Save the Cruise Industry? BARCELONA, Spain—When you think of the world's biggest mobile brands, Royal Caribbean probably isn't the first name that comes to mind, but its fleet of ships are slowly becoming floating digital hubs. Speaking during a Mobile World Congress keynote, Royal Caribbean's chairman and CEO Richard D. Fain talked about how apps, robots and Wi-Fi are shaking up travel. But that doesn't mean it's been easy to take a business that requires long processes (like traveling internationally) and massive pieces of equipment into the digital era. Plus, it's no secret that the cruise industry has struggled in recent years to keep up with a seemingly never-ending headache of safety and PR disasters, causing some brands to test out new technology like virtual reality to rope in new customers. So, can mobile and digital technology help turn around business? "I'm not prepared to say that we're a digital business," Fain said. "But I would say that it has made a total difference in the way that we produce our product." Fain said one of Royal Caribbean's biggest mobile successes to date is an app that speeds up the boarding process. In the past, lengthy check-ins required travelers to get cleared by governments and Homeland Security—a process that took over an hour to complete. With the app, people type in their own information. "We can now get you from curbside to shipboard in 10 minutes," he said. People can also book a cruise, view maps of the ships, find deals on trips and look up activities taking place on the ship with Royal Caribbean's app. The brand has also installed robots on its Quantum of the Seas ship with robot bartenders. Guests place their drink order from a tablet and pay using radio frequency identification (RFID)-enabled wristbands. The robots don't replace employees, though. "It's not that it's impersonal—actually we use more people to deliver drinks," Fain said. "The people are now spending their time talking to the guests." In terms of Wi-Fi, Royal Caribbean has beefed up its ships with fast Internet, which was a challenge because Internet speeds and connections are different all over the world. Equipping ships with large satellites boosted Internet bandwidth by 500 times, which helps crew members stay in touch with family and friends since they can be away from home for months at a time. Each staffer is given a tablet that they can use to stay connected on cruises. "I was actually a little surprised to be invited here. I didn't really think of ourselves as a mobile company, but when we looked at it, we really are a mobile company," Fain said. "We're just like Samsung. It's just that our mobile devices are a little bigger—about 200,000 tons, and we regularly seat 6,000 for dinner."